On November 19, the Favorite Acting awards in the Singapore and Malaysia regions were presented at the 2018 TVB Anniversary Gala for the first time ever. The results were surprising as both Benjamin Yuen (袁偉豪) and Mandy Wong (黃智雯) snagged two My Favorite Actor and My Favorite Actress awards respectively. 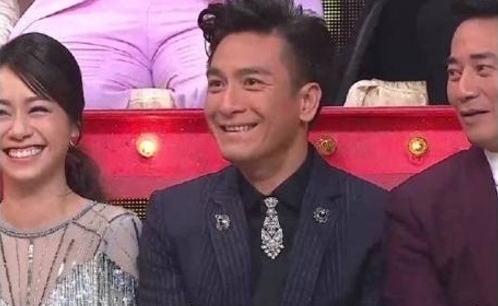 Although Kenneth Ma (馬國明) in Deep in the Realm of Conscience <宮心計2深宮計> was one of the top three contenders for Singapore, he ended up losing in the TV King race once again. Despite the 44-year-old actor successfully winning the audience’s hearts since his debut 19 years ago, he has never been given the TV King title – be it at the TVB Anniversary Awards, Singapore’s Starhub TVB Awards, or TVB Star Awards Malaysia. Even though Kenneth has been nominated for the award each year since 2015, it seems as if he is just running on the sidelines. Last year, he was a hot contender for his performance in the well-received drama, The Exorcist’s Meter <降魔的>, but only managed to snag TVB’s My Favorite Male Character. Even so, Kenneth never complained about the hardships and focused on honing his acting skills. He would watch his colleagues receive the Best Actor accolade while he sat in the audience, even making headlines for displaying stunned expressions over the results. In recent years, the artist has managed to stay composed at award shows. At the TVB Anniversary Gala this year, he was seen clapping for Benjamin after losing to him in the Singapore region. However, there are still netizens who pity Kenneth’s lost and even crowned him as the people’s TV King. They left messages online to show support and complained saying he should’ve won the prize. Meanwhile, hot out of the oven TV King Benjamin acknowledged Kenneth’s large group of supporters. Honestly, I don’t think Kenneth Ma has anything TV king worthy at all. The closest thing I would say for him is his role in “The Hippocratic Crush”. Which is a shame because he is a good actor. I thought he could maybe win it by default considering the recent decline in quality actor but even then, there is always someone above him, like Vincent. Kenneth’s best opportunity was last year in ‘The Exorcist’s Meter. It was a big year for him because he also did well in ‘My Dearly Sinful Mind’. I felt he knew it was his last big chance and for once he really wanted the award but it was not meant to be. It reminds me of 2003 when Kwong Wah had a flawless gem of a performance in ‘King of Yesterday and Tomorrow’ but Roger takes the award for brilliant performance in cheap looking production ‘Square Pegs’. With the emergence of young actors and veterans moving on to web series, Kenneth may never win the ‘Best Actor’ award unless TVB decides to hand out freebies like they did to Mandy and Ben this year. In ‘Deep Beyond’ Steven was much better than Kenneth so even having Kenneth nominated will be a bit of joke. Vincent was the better man last year and although his marriage rumours are a big turn off, it is quite obvious that his acting is also the best this year…. @jimmyszeto totally agree with you. @jimmyszeto Yeah, last year was his best opportunity, but in retrospect, I don’t his performance in Exorcist’s Meter wasn’t THAT amazing if compared to previous TV king winners, but it was great considering today’s standards, which is why I thought he had a chance, but unfortunately I will have to agree that Vincent was better than him. In defence of Roger, he did very well in Square Pegs. Just because the drama was cheap, it doesn’t deny Roger’s acting skills. Kwong Wah was just unlucky that year. But Roger’s second win for the same role feels cheap. Poor Kenneth Ma! He did not seem to have any luck in getting TV King awards, not even in Singapore or Malaysia. Kenneth’s acting may not be the best among actors’ in TVB drama series last year, but his should at least be a lot better than Benjamin Yuen’s acting. Benjamin had improved a bit over the years, but is still fairly emotionless. Kenneth Ma ,you still had my support from Malaysia, stay strong. I still love Kenneth! He is still way better than Pakho and Benjamin. It’s also about timing and luck. If The Exorcist Meter is airing this year and not last year, Kenneth Ma would easily win all the most favourite and best actor awards. Last year, Vincent Wong is already at the top of the field. Btw, Kenneth did win best actor (most favourite lead actor) in Malaysia back in 2012 for The Hippocratic Crush (back then the award is called Astro on Demand Awards). This year is not for him ,since he only has one series and the role isn’t anything special. @jimmyszeto but since vincent already won just last year, and if exorcist meter is aired this year, then kenneth has higher chance definitely. so far vincent is good in fist fight but if u pair it up with ma gwai from exorcist meter thinking that vincent ady won last year, most people and tvb itself will certainly give it to kenneth now finally. I agree based on your reasoning but we are only a few episodes into ‘fist fight’. Likely lots more to come from Vincent…. Ruco has been the ‘people’s champion’ for the last few years. Thanks to Kenneth’s energetic performance in ‘the Exorcist Meter’ there has been a slight change. I like Kenneth. I hope he will win someday.